I hope to be putting up some audio clips of this soon. With his crew of 27 men, Sir Ernest Shackleton set sail from England in August 1914 in the Endurance, with the intent of being the first to completely cross Antarctica on foot, having just missed being first to reach the South Pole. Already internationally famous for two previous expeditions to the Antarctic (his 1907 expedition had marched to within 97 miles of the Pole, but Amundsen made it first in 1911), Shackleton obtained funding to outfit an expedition and purchase the Endurance, one of the last wooden ships designed for Arctic travel, and one of the strongest wooden ships ever made. Simply put, Shackleton failed to reach his goal of a transcontinental Antarctic crossing. However, when the Endurance became ice-locked and was eventually crushed, the fortitude and heroism required to survive and save his crew has spawned several books and documentary films. The crew lived on the ice-locked Endurance for 10 months as the pack drifted slowly northwest in the Weddell Sea. Through the long Antarctic night, Shackleton maintained the hope of his men that with the “summer”, they would be able to free the ship from the ice and continue to their destination. However, the Antarctic ice pack is always in motion even in the coldest times, and the forces it generates are enormous. After several months the Endurance was slowly crushed before it could be freed from the ice. Shackleton ordered the crew to offload onto the ice as much of the ship’s stores and gear as they could, including three “lifeboats” (a whaling boat and two cutters). Now living on the ice, Shackleton had to make many decisions about how best to lead his crew to survival. Should they attempt to travel on foot over the ice to reach land? Should they simply wait for the ice to drift closer to land? How much could the men carry if they decided to abandon their ice floe encampment? Eventually, a series of over-ice journeys were made, dragging the boats for each leg, sometimes then sending back men for supplies or a boat left behind. Sometimes the men were forced to simply “ride the ice floes” and hope the tides and winds moved them in the direction they wanted to go, helplessly changing directions. The boats were launched when the ice became unstable or soft and enough open water appeared to allow it. Nights were always spent on the ice. There were many very close calls, where death of one or more crew members was narrowly averted, in many cases due to Shackleton’s alertness, and, paradoxically, his caution. After a perilous journey where the three boats were nearly separated, and where the boats were nearly blown out into the open ocean, the party made its way to Elephant Island, well north of the northernmost tip of Antarctica, above the Antarctic Circle, almost directly south of the Falkland Islands by some 600 miles. No one on Earth knew where they were, or even that they were still alive. Shackleton determined that the only option was to send a party to South Georgia Island 800 miles northeast, where the expedition had made its final stop in preparation for the Antarctic journey, and where they could expect help to rescue the rest of the crew. On Easter Monday, April 24, 1916, Shackleton and five others (including the captain of the Endurance, a very skilled navigator named Worsley) set out in the whaling boat, the James Caird, with a sextant, aneroid, prismatic compass, anchor, some charts and a pair of binoculars as their instruments. This journey was to be made through possibly the worst seas in the world, the Drake Passage in late spring, in a 22 foot boat that had been strengthened and had a deck added (to prevent swamping) by the efforts of McNeish, an accomplished shipwright, who’d had to cannibalize wood from parts of the other two boats to do it. McNeish was doubly motivated, since he was to be one of the crew to sail the Caird to South Georgia Island. Those who stayed behind on Elephant Island made a hut from the remains of the other two boats, some old tent fabric and some stones. The two boats couldn’t be totally destroyed or burned for warmth and cooking, since if rescue did not occur in a matter of some months, the remaining leader, Wild, had instructions from Shackleton to load the boats and make for Deception Island to attempt another Antarctic winter. These men suffered incredibly from blizzards, hunger and ill health, and perhaps had the rather more difficult task of waiting for an uncertain rescue. As for Shackleton and his five crew on the James Caird, their suffering in the first week of the journey was no less. They were constantly soaked, never warm, frostbitten, and faced with the necessity of chipping ice off the boat as it froze, lest the boat become too heavy. At length it was necessary to throw items over the side to lighten the boat, such as seemingly permanently frozen sleeping bags, useless oars, etc. A thousand different times it appeared the small boat would capsize, but she lived on. When the weather finally cleared briefly, Worsley was able to take a sighting with the sextant, determining that they had been blown about half-way to South Georgia Island. Over the next week, the crew survived a gigantic wave (larger than any of these experienced seamen had ever seen), biting thirst, and utter exhaustion, to sight the black cliffs of South Georgia Island just fourteen days after their departure from the rest of the crew. It took another day, much effort and incredibly good fortune to make a safe landing without shattering the vessel and themselves on the rocks. Shackleton attributed their survival to Worsley’s incredible navigation. Unfortunately, they were now on the uninhabited side of the island. There was no path around its periphery, and they dared not re-launch the boat in an attempt to get to the other side of South Georgia, for fear of being blown out into the open south Atlantic. The only option was to go over South Georgia’s mountains and glaciers, as high as 4500 feet, a journey that had never been made. After some rest and planning, Shackleton took Worsley and a crewman named Crean for the climb, which they made with 50 feet of rope and a carpenter’s axe. This was an epic journey, not attempted again until the 1950’s by a modern, well-equipped expedition. The men were exhausted at one point, after several backtracks had been necessary, and sat down to rest. Worsley and Crean fell asleep immediately, but Shackleton knew they would freeze if he let them sleep. After five minutes, he wakened them, told them they’d slept for half an hour, and got them moving again. There was a point where they were at a high altitude, and a windy, cloudy, foggy weather system was blowing in, which would leave them with nearly zero visibility, where they would freeze in the storm before being able to get down lower. The ever cautious Shackleton decided there was no recourse but to risk sliding down the side of the glacier to a more sheltered spot, which they did like children, sitting on a hastily improvised rope sled for nearly a 1000 foot toboggan ride. After many close calls and a 36 hour journey with only the previously mentioned 5 minutes of sleep, the three weary travelers (each of whom later claimed to sense a fourth Presence during the trek) walked into the settlement from the interior of the island, a direction from which no one ever came, to the total astonishment of the inhabitants, some of whom knew Shackleton, but did not recognize him in his bedraggled state. It took until August 30, 1916 and four attempts, the first three blocked by impassable ice and ship breakdowns, before Shackleton was able to rescue his crew at Elephant Island and bring them home, with all hands surviving. Though his concern for his men, and willingness to sacrifice for them, was legendary, Shackleton was not a wholly admirable character, with rumors of philandery and sharp dealing with other people’s money in his background. Regardless of his character flaws, however, as one of his colleagues attested, “When you are in a hopeless situation, when there seems no way out, get down on your knees and pray for Shackleton.” For his part, Shackleton’s later writings attributed their survival to Providence. In composing a piece of music about an epic “man against forces of nature” adventure, I decided that the perfect 5th was as close to a musical force of nature as I could discover, due to its position in the harmonic series. Two melodic 5ths open the piece, and nearly every theme, accompaniment and texture uses them in various ways. The first four movements of Endurance are Sea, Ice, Wind and Night. The sea is mysterious and turbulent, by turns calm and violent, curiously irregular in its underlying rhythms, able to provoke senses of peace or apprehension, with occasionally explosive power. The Antarctic ice is cold, hard, sharp, crystalline and somehow impersonally, enormously alive, always moving, with small shattering shifts inside more massive icequakes, sometimes suddenly convulsing, other times advancing with the force of inexorably crushing megatons. Occasionally, portions of the ice pack reverse direction unpredictably due to winds and ocean currents, then slowly return to the original course. Listen for the men having dog sled races in the dark, a practice frowned upon by Shackleton. The Antarctic wind is ever present, constantly changing directions and speeds, and capable of creating strangely repetitive noises in temporary huts and tents. The Antarctic night is 70 days long, and must make the world seem a very forlorn, lonely place. The last, and longest movement, Mountain, tries to tell the story from the landing on South Georgia Island until the rescue. It opens with the “mountain theme”, and moves through the fairly easy early part of the journey into the climbing up and down of various icy peaks (dangerous and beautiful), and attempts to musically portray the jaggedness and backtracks of the first part of the journey. There is the very brief period of rest, then the climb to high altitude with the blizzard weather front moving in, the slide down the mountain, and further wandering. The trumpet melody signals the last slow walk into civilization, as Shackleton has now appropriated the musical theme that belonged to the mountain, and put his own personal stamp on it. You’ll hear the growing wonder of the town as they realize what has happened and greet the explorers, adding their voices to Shackleton’s theme. A sort of Irish jig represents the celebration of Shackleton and company at their survival (he was Irish by birth, his branch of the family having left Yorkshire in England in the 1700’s). 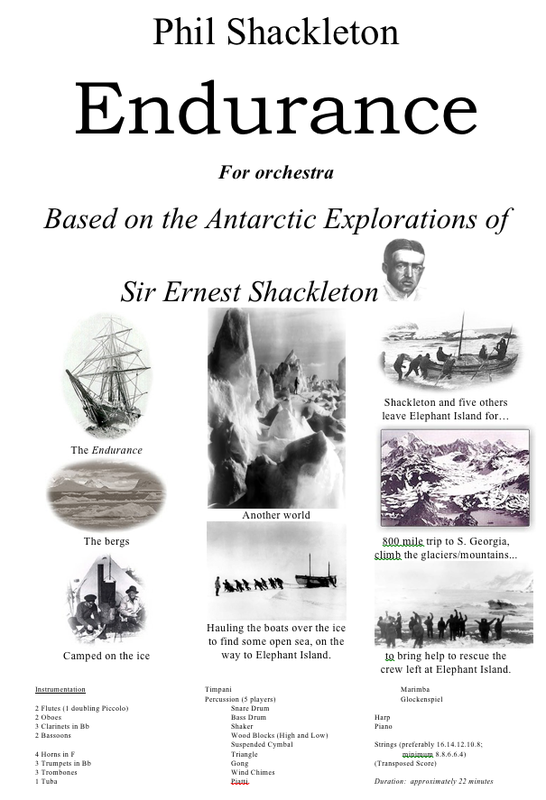 The snare drum announces Shackleton’s determination to rescue the others as soon as possible, and the rest of the piece portrays their triumphant return.